The word Folk was earlier referred to Regional Traditional or Folklore Music. As time went by it was acculturated and its meaning moved away from the original one and, in the 60s, gained a wider meaning. Today the genre Folk is usually associated with Rock Ballad, Country Ballad, Blues Ballad, Soul Ballad, Latin Ballad, Pop Music and, in Brazil, to the Canção Brasileira. Around the world, some artists who represent this style are: Bob Dylan, Joni Mitchell, Donovan, John Denver, Cat Stevens, James Taylor, Neil Young, Joan Baez, Van Morrison, Richie Havens, Arlo Guthrie, Marianne Faithfull, Scott McKenzie, Crosby, Stills, Nash & Young, America, Bread, Peter, Paul & Mary, Simon & Garfunkel, The Mamas & the Papas, The Byrds, The Incredible String Band, Jim Croce etc. 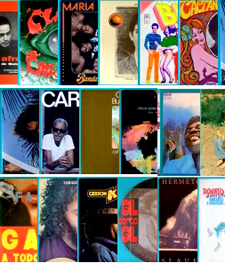 In Brazil, some artists who represent this style are: Beto Guedes, Lô Borges, Flaviola, Grupo Água, Grupo Taracón, Guilherme Lamounier, Tavito, Sá, Rodrix & Guarabyra, Luiz Carlos Sá, Zé Rodrix, Guttemberg Guarabyra, Sá & Guarabyra, Belchior, Fagner, Alceu Valença, Geraldo Azevedo, Grupo Raízes, Roze, Renato Teixeira, Piry Reis, Paulo Diniz, Hyldon, Paulinho Moska, Oswaldo Montenegro, Sérgio Sampaio, Zeca Baleiro, Nosly, Nílson Chaves, Boca Livre, A Barca do Sol etc. 48 records plus booklet on 4 boxes! 1st Edition! This single with Printed Sleeve is Ultra Mega rare! A Myth of Brazilian early '70s Psychedelic Music!